What is the cap and where does it come from? 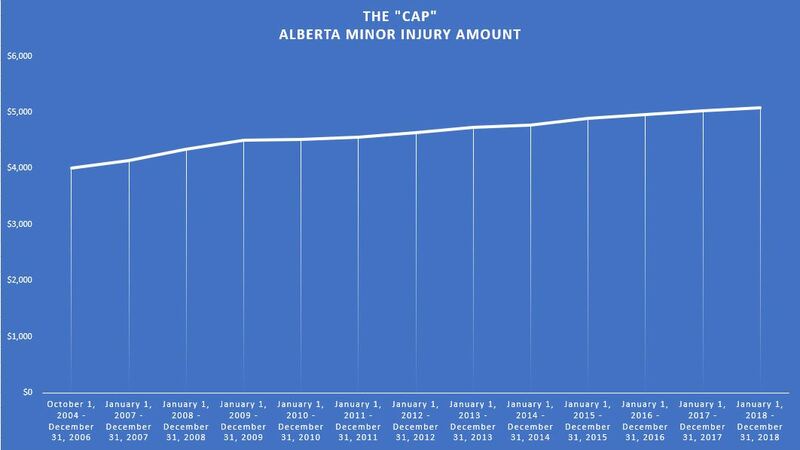 The Minor Injury Regulation, introduced in 2004 by the Alberta Government, limits compensation for less severe injuries on non-pecuniary general damages (pain and suffering). The regulation places a “cap” on how much an injured person with minor injuries can potentially recover in general damages. What type of injuries are capped? The Minor Injury Regulation applies to injuries caused by accidents involving automobiles. The compensation that can be claimed for pain and suffering as a result of minor injuries is limited by the cap. Minor injuries include soft tissue injuries (such as some strains, sprains, and whiplash associated disorders), some TMJ injuries, and some psychological conditions or symptoms arising from sprains, strains or whiplash injuries. A soft tissue injury includes damage to the muscles, ligaments and tendons throughout the body that do not affect a person’s employment, leisure or other activities on a long-term basis. The Minor Injury Regulation does not place a cap on compensation for medical expenses, loss of housekeeping capacity, cost of care, or lost wages. The cap was originally $4,000 but has increased yearly to account for inflation. The 2017 cap was just over $5,000. The 2018 cap is $5,080. This means that if you are involved in a motor vehicle accident in 2018 and your injuries are only minor injuries that fall entirely under the cap, then the maximum amount of general damages that you may be eligible to receive is $5,080. Will my claim be capped? It is difficult to say, particularly at the outset of a personal injury file, whether a claim will fall entirely under the cap. The definition of “minor injury” is complicated, and determining whether or not an injury will count as a minor injury depends on a number of different and complex considerations. To determine whether something is a “minor injury” that falls under the “cap”, a lawyer or insurance adjuster may look at a number of different things, including: a person’s medical records, the Minor Injury Regulation, The Diagnostic and Treatment Protocols Regulation, and relevant case law. Sometimes, injuries take time to manifest themselves and the true nature and extent of an injury may only be revealed after a person has undergone additional medical testing or treatments. What is more, just because an accident seems like a minor fender-bender at first does not mean that it cannot cause major injuries. Likewise, sometimes people escape seemingly serious accidents with only minor injuries. A personal injury lawyer can, once they have your relevant medical documentation and history in hand, assess you claim and determine whether it is possible to argue that your injuries should not fall under the minor injury cap. Personal injury lawyers have the understanding and experience to help you maximize your claim. If you have been injured in a car accident, contact a personal injury lawyer to discuss your situation and options.